If you’re missing all of your teeth, a palateless denture provides an affordable, comfortable option to replace them. Before you ask your dentist about this option, get the facts. A palateless denture is made to replace your upper teeth. It is open in the center, so it doesn’t cover the root of your mouth. The denture is made in the shape of your arch, similar to the shape of your gumline. It helps the denture fit securely. A traditional upper denture covers the roof of your mouth. This provides suction to keep the denture in place. Without a palate in your upper denture, it would frequently dislodge and fall out due to lack of suction. Grooves are made in the base of the denture so that it can snap onto dental implants. 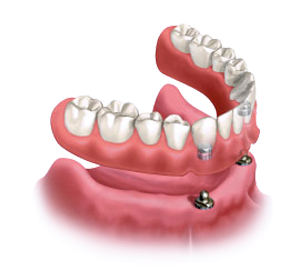 Implants provide stability and keep the denture from slipping around. As few as two dental implants can be used to snap on the denture, but the more implants there are, the more stable your dentures will be. People who have worn dentures with a palate and later try this option prefer the palateless version. It’s more comfortable, and eating is much more enjoyable. Interested in Dental Implants and a Palateless Denture? If you want to receive implant dentures, schedule consultations with two or three implant dentists. Each dentist should be concerned about reviewing your medical and dental history to find out if you are a candidate for implants. No dentist should recommend dental implants without verifying your eligibility. Diagnostic studies are needed to ensure you have enough jawbone density for implants. If not, bone grafting will be required. Don’t choose the cheapest option. Look for a dentist with extensive training who offers high-quality implant fixtures. Why invest your time and money into an oral appliance that won’t last? Wearing dentures can be made as comfortable as possible with a palateless denture that is supported by dental implants. Implants prevent jawbone shrinkage and facial sagging. The time and investment are worth it. Will teeth whitening work on my dentures? Ethel – The situation with your dentures is unfortunate. It does sound like you’ve invested in poor-quality dentures. Neither teeth whitening strips nor any other form of whitening will change the color of your dentures. The teeth in the appliance are colorfast. Although stains can be removed from them with denture cleaner, you won’t be able to make them lighter than the original color. It seems that you’re taking good care of your dentures. Although teeth whitening won’t work, continue to do what you can to preserve them. Below are a few tips. Use pastes and cleaners specifically designed for dentures. Many types of toothpaste are too abrasive for denture teeth. Use a soft-bristle toothbrush to clean the appliance and your gums, tongue, cheeks, and the roof of your mouth. Remove your dentures before you sleep overnight. Avoid boiling your dentures. Extreme heat can permanently destroy the shape. Don’t bleach your dentures. Bleach is not meant for oral appliances, and it can be toxic. If stubborn stains aren’t removed with denture cleaner, they can be ultrasonically cleaned in your dentist’s office. Keep your dentures moist. Safely store them in a mild soaking solution. Ensure you store your appliance out of the reach of children and pets. In time you will need new dentures. When you do, find an accredited cosmetic dentist. He or she is trained in dental aesthetics. You will receive high-quality, cosmetic dentures that look natural. Your prosthesis will be customized to complement your facial features and preferences. You’ll have input on the shape and color of the denture teeth, too.